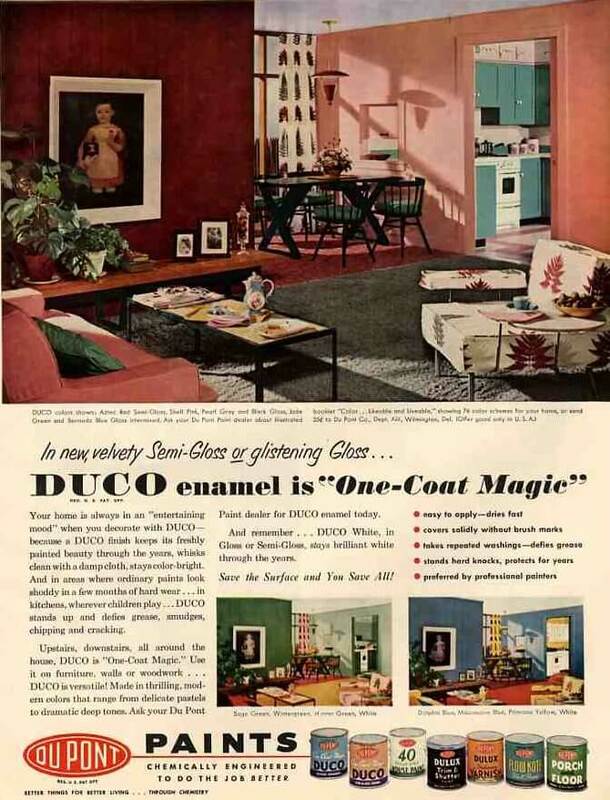 I feel like I’ve been very focused on kitchens and bathrooms the past several months, so for the next several weeks I will be trying to spotlight a greater selection of 40s 50s and 60s living rooms, dining rooms and bedrooms. 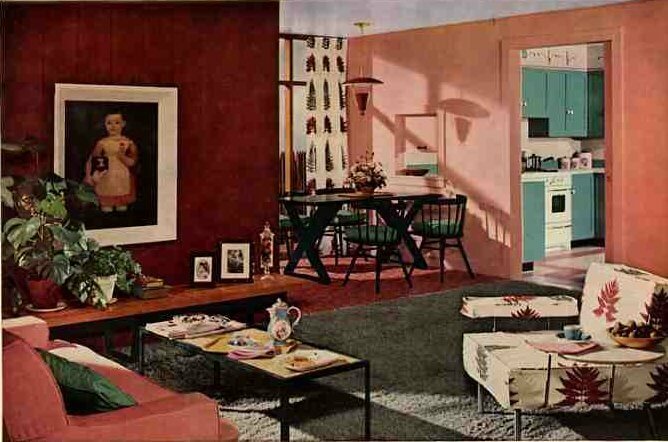 Let’s start with this amazing living room dining room from 1952. The color combination is simply mesmerizing – to me, at least. This particular shade of pink (touch of salmon?) is so inviting…its relationship to the paneled wall is brilliant – I would never have thought of trying this…and the ‘peek’ into the aquamarine kitchen is terrific, too. Notice also how they’ve matched the floor-to-ceiling pinch pleat draperies to at least one chair, a classic designer trick. And last, I think it’s so wonderful how — again — they’ve included colonial details like the gorgeous oil painting and the dining room table (laquered in black to modernize it). This addition of the unexpected…makes this room all the more perfect. 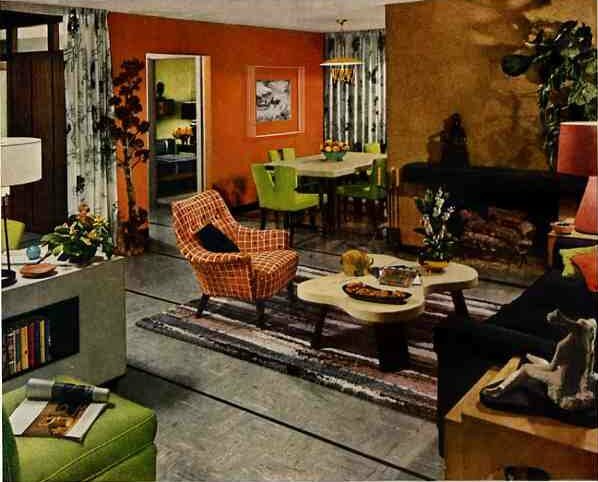 Have you noticed how this color scheme is the same as Joan Harris’ (nee Holloway) apartment on Mad Men? 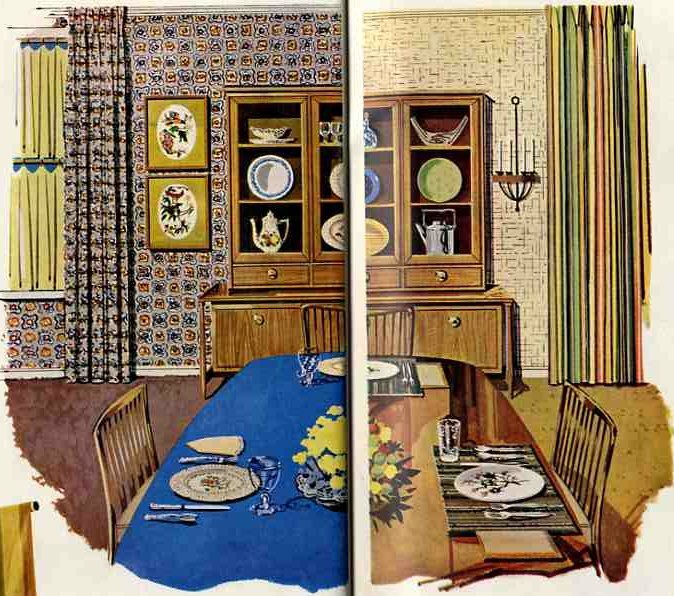 Almost exactly but her furniture is much older looking from the 1950s. I’m working on a post for my home blog, SHELTERhome about her apartment and the items in it.